Now, depending on how you interpreted Setzer's personality in Final Fantasy VI and Kingdom Hearts II, you may find yourself disagreeing with this piece of trivia. To most, though, you'll probably agree that Setzer's personality between the two games was radically different. The core of his personality was there in Kingdom Hearts II--a risk-taker who gambles for everything in his life--but he was a lot more cocky and underhanded. 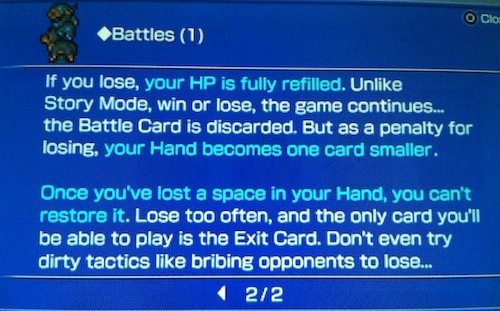 In Kingdom Hearts II, during the struggle match in Twilight Town against Roxas, Setzer tries to bribe Roxas by telling he'll make it worth his while if Roxas throws the match. Some argue that the Final Fantasy VI version of Setzer would never do something like that. Some take it further, believing that Dissidia: Final Fantasy addresses the personality discrepancy found between Final Fantasy VI and Kingdom Hearts II's Setzers. 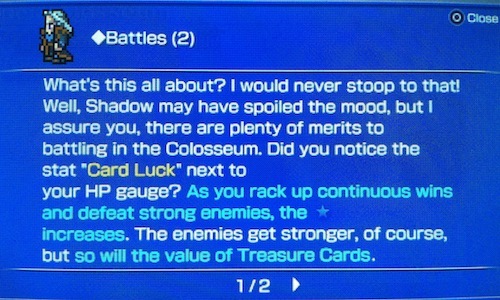 In the Duel Colosseum manual found in Dissidia, Shadow says "Don't even think of bribing your opponents to lose", to which Setzer responds back with, "What's that about? I would never stoop to that!" If Setzer meant that seriously or if he was being sarcastic, that is up to you to decide. Do you think it was a reference to his personality in Kingdom Hearts II, or are fans just over-thinking things like always? It'd be great if it was an intentional reference, but personally I've always thought Setzer was a less-than-noble man. Tell us down on the forums and don't forget to catch up on all of our past trivia!